This gorgeous set features three sterling silver oval toggle clasps that I've set with 6mm carnelian stones and converted into earrings and the loop for the lariat. The necklace strand is about 27" long, and the longer of the two dangles falls approximately 4" below that. Strand and dangles are comprised of 4mm and 6mm round carnelian beads, 8mm Indonesian sterling silver beads, and smaller Indonesian sterling roundels. 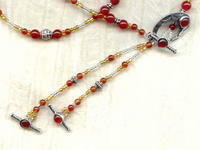 The glowing golden seed beads are Italian, and very difficult to find; the sparkling silvery ones are from Japan. 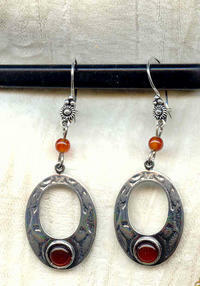 The matching earrings measure 2-1/4" from the tops of their Indonesian sterling silver European style findings. 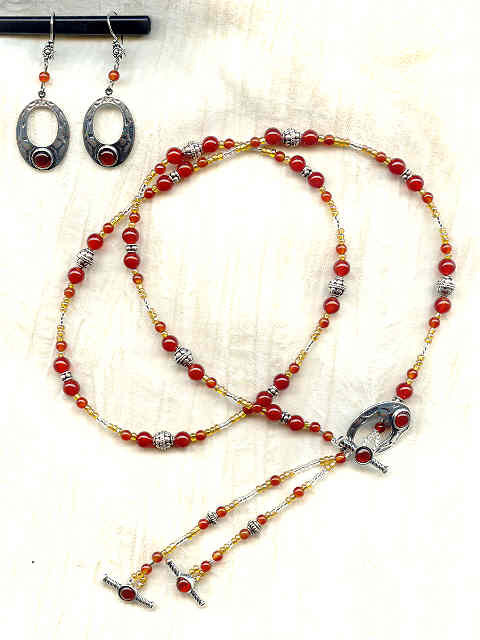 Gorgeous and elegant at the same time, it's another incredible necklace and earrings set from SPARKLE PLENTY.